Thanks Dallas, Bob, Martin and Mike for the kind words and smilies ! Superb modeling Hakan !! But how do you do the funny a when you type. Wondering for time now..
Great now is that with some of the scenery and the ballast in place I can actually run some trains. Which I haven't been able to do for awhile. And now I also must get a grip on myself and continue on with some tracklaying in the lower areas at Innsmouth. Think I found it H�kan, no swedish keyboard for me but I guess I found some typical characters more like the �. Good to hear you can run trains again ! this weekend came the first snow here in south of Sweden so the weekend has been filled with outdoor activity, read shoveling to get the cars out . But happily there has been some time over for modeling which nearly entirely has been devoted to tree making. I have made a lot of bushes and small trees from seafoam material to plant as secondary growth in the growing forest . Also I have tried making some spruce trees to have as a contrast to the big redwood trees. The redwood trees has bothered me alot as they look a bit too uniform and I have worked on them trying to make them a little more disheaveled and rough looking. 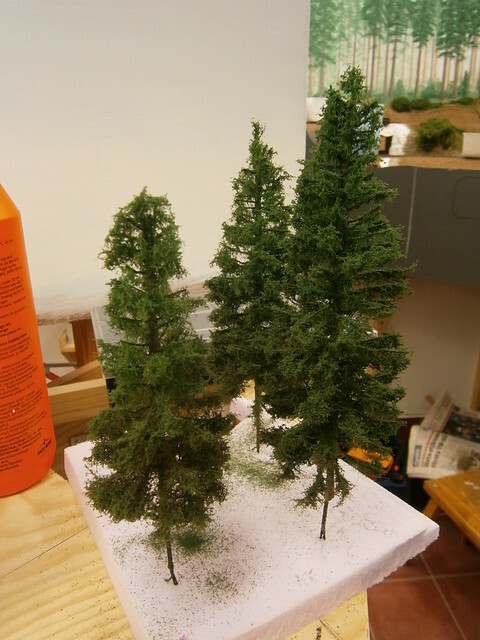 The spruce trees were made using Martins and Jos fantastic method using a static grass applicator (Many thanks if you read this!). The tree frame was made with the bottlebrush method using thin steel wire for the branches. When it come to planting trees I have run in to some problems with that I want a quite thick and dense forest but I still want to be able to see the trains clearly. I have enclosed some pictures of my first spruce tree attempts below. I'm not very happy on how the top of the trees came out but I'm working on it. That said, I'm amazed by your ability to so successfully model an area so far from your home. Few people here in North America portray regional differences as well as you do! Thus I only note these minor discrepencies because you are so careful to model all other details with great accuracy. H�kan, try only the top from above with the static grass machine maybe that'll give you a more satisfying result..
Hi H�kan, I think you have done a fabulous job with your trees! I can almost smell the pine scent from Canada. If you make them any better, you better watch out. 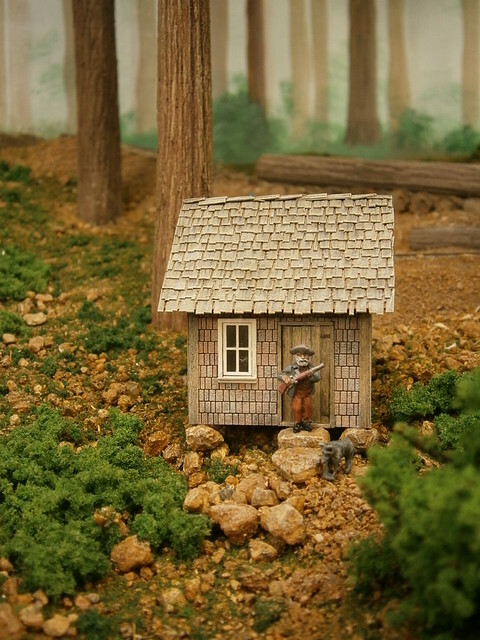 The lumberjacks you have on your layout might want to chop them down. Timber!!! Many thanks Frank for the information and your kind words! I think I have looked a little too long on our domestic spruce here in Sweden. Thanks Martin, I'll try that. Thanks Greg! Sound has long been the new dimension in modeling perhaps the next one will be smell Perhaps a newly cut piece of resinous pine tree hidden under the layout. If you make them any better, you better watch out.The lumberjacks you have on your layout might want to chop them down. Timber!!! Indeed they want to! Talking about lumberjacks they will find stiff resistance from this local woodsman who doesn't like either the photographer nor the lumberjacks chopping down his wood . He may look mean but actually he is quite a peaceful fellow and uses his gun solely for hunting. As you can see I covered the transition with some glue and sawdust. 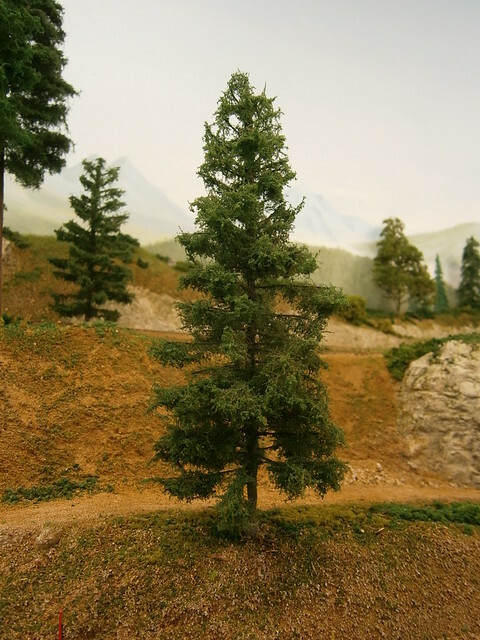 As always it is a lot of fun watching your layout pictures /progress specially the attempt to let it look like a forest with "giant"trees! Those trees are absolutely superb! As is everything about your layout. This is fast becoming one of my favorite threads on here. 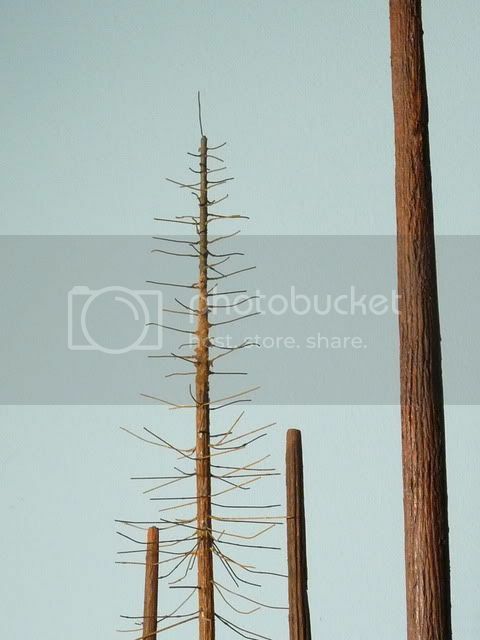 Personally, I've never found some of the more popular traditional tree-making methods very realistic - they look representative of trees, sure, but they're still clearly models. 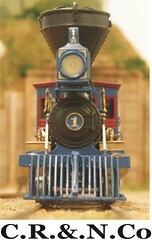 The results in this technique, however, could be quite difficult to recognize as HO scale rather than 1:1. VERY nicely done. I'm happy you dropped by Jos! Thank you for the kind words. Also thank you for your tutorials and for sharing your techniques! Without them I would have been lost in the woods . I'll try your suggestions and see if I can improve the top. ChrisS. Thank you. It is double joy when someone beside oneself likes it. It is still a long way to a complete forest but we are slowly getting there. H�kan, what a magnificent landscape. Your work is really impressive! And this place would be a pleasure to live in in real life. Autumn has been great for modeling but now as X-mas is approaching there is less and less time for modeling. Hopefully more time will be available after all the shopping and preparations has been done!